It looks like Twitter can be carefully taught. According to the Pew Internet And American Life Project, internet users are becoming more comfortable updating their statuses online. they use Twitter or another service to share updates. That’s one in five internet users. And good news for marketers. 20 points to 31%, while usage among those 35-44 jumped 10 points to 19%. Meanwhile, the median age of a Twitter user is now 31, and the media age for Facebook is now 33, up from 26 in May of last year. 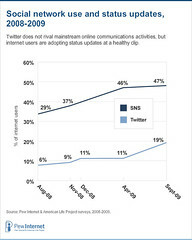 Predictably, web surfers with a wireless mobile device are more likely to twitter. And those who own multiple mobile devices are even more likely to twitter. Marketers are finding social media to be an increasingly fertile ground to spread their brand messaging, and increasing usage of real-time updates is a good thing for brands. Twitter’s founders are clear on this issue. “If we’re driving that value for businesses, we’re not that worried about extracting value for ourselves. 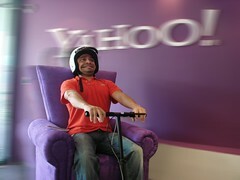 If your website gets massive traffic, or you are building a new website and can’t sleep at night because you’re worried that you will, Yahoo wants to help. And it doesn’t want anything in return, except maybe your love. On Tuesday, Yahoo will announce that it has open sourced Traffic Server, the HTTP web proxy cache it uses internally to serve up millions upon millions of requests to its users on a daily basis in an efficient manner. After much discussion about ‘marketing attribution’, the process of awarding different marketing events different levels of commission depending on their role in the conversion, it seemed appropriate to explain how exactly this works in practice and to demonstrate that the technology is available to make it happen.